GRAPELAND – With Veterans Day falling on Saturday this year, many area businesses and school districts expressed their appreciation to those who served in the United States Armed Forces on Friday, Nov. 10. One such organization was Grapeland ISD. 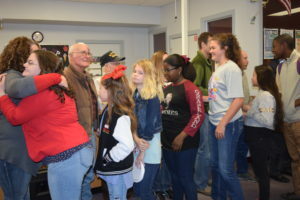 The district invited area veterans to a reception beginning at 9 a.m. and several students expressed their gratitude to the soldiers, sailors, airmen and Marines in attendance. “I think I speak for our entire student body when I say thank you so much for your service. We are honor ed to have you here,” a GHS senior said. “I just want to say thank you for all your courage and bravery to go out there and fight for us,” a sixth grade junior high student commented. As the reception continued, several of the veterans returned the favor and expressed their thanks to the district and students for hosting the reception. 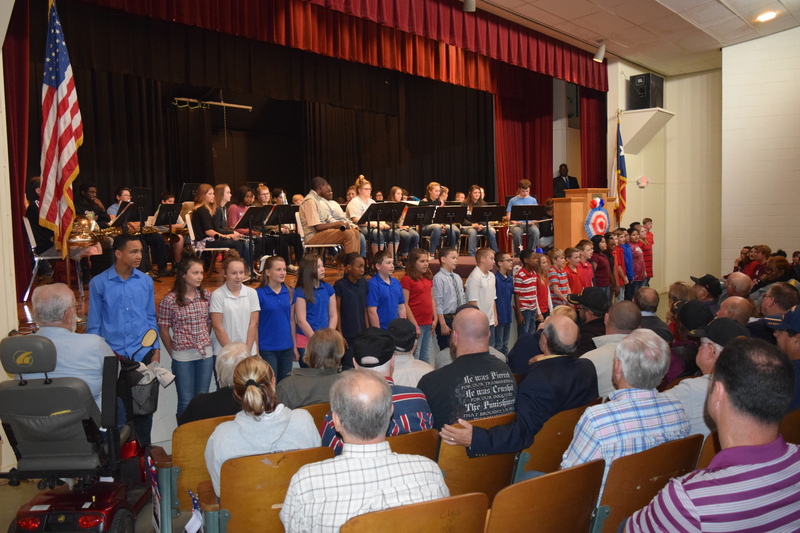 Following the reception, the veterans were led over to the Lorena Shoultz Auditorium for an assembly in their honor. The veterans were greeted by GISD Superintendent Don Jackson and the district’s student ambassadors as they made their way to their seats. Once the welcome concluded, pledges to the American and Texas flags were given followed by the playing of the “Star-Spangled Banner” by the Grapeland Sandie Band. GHS freshman Cierra Simon followed the band and read a poem entitled “The Noble and the Brave,” by Joanna Fuchs. At the conclusion of the poem, the fifth grade students of Grapeland Elementary joined together in song to sing “Livin’ in the Homeland,” a musical composition by Randy Vader. The music continued after the song ended as the Sandie Band cranked up the marches of the armed forces. The band was followed by the reading of a second poem. This sonnet was entitled “Just Another Veteran’s Day.” The poem was written by Franklin Price and read by Taylor Pennington. 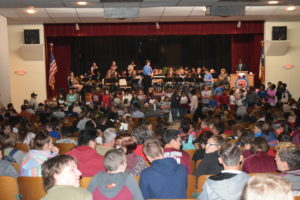 The music returned after the poem’s conclusion as the band cranked up “God Bless the U.S.A.” The entire elementary joined in the singing and brought several tears to the eyes of the veterans in attendance.